GarageBand is a great tool to make custom music. I use it to produce music for photo slideshows or home movies. 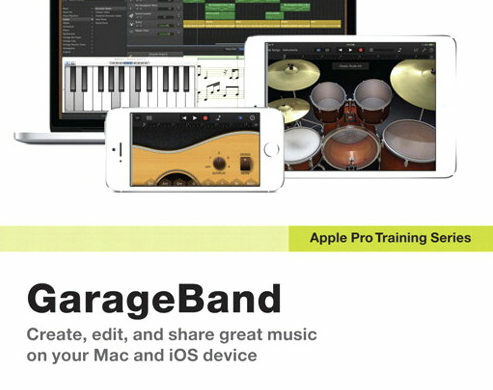 The book Apple Pro Training Series: Garageband is a great guide for newcomers with the software. The book is divided into nine lessons with downloadable content for you to follow while reading. There are also two bonus lessons that can be downloaded from Peachpit’s web site, using the download code provided in the book. The first few lessons will introduce you to the interface by familiarizing you to GarageBand projects, tracks and the Apple provided loops. The next two lessons address recording and editing software instruments and audio tracks. Lesson 6 is dedicated to electric guitar players, while lesson 7 is all about creating drum and percussion tracks. Lesson 8 explains basic of music mix and EQ effects to enhance the final result of your work. The book ends with a chapter on how to share your music using the tools and services found in GarageBand. The two online bonus lessons are downloadable PDF. The first one is on how to learn to play piano and guitar using GarageBand. It explains how to connect your instrument to your computer and configure it for GarageBand. Then it goes into Learn to Play, a feature Apple introduced a few years ago to GarageBand, that helps users learn an instrument. You’ll also learn how to record your performance. The second online bonus lesson is dedicated to GarageBand for iOS. It covers the software on both iPhones and iPads. All chapters, or lessons, are very well illustrated and will introduce the basics you need to know about the software. This book is a very good introduction to GarageBand, and even a good refresher for people using it only occasionally like me. It gives some hints that may be useful timesavers techniques.